Container gardening with perennials adds a whole other gardening option to your outdoor areas. This is a plant that lives for more than two years, and includes woody plants like shrubs and trees as well as many foliage plants and ornamental grasses. Flowering perennials will grow and bloom over the spring and summer, die back every autumn and winter, and then return in the spring. Overwintering will allow you to keep the plants growing from year to year, and proper grooming will keep them looking their best during the blooming season and beyond. Container gardening with perennials provides you with many varieties from which to choose – bot for sun and shade. Plant them alone in containers, or add annuals for longer bloom times. The best thing is you don’t have to replace them every year. 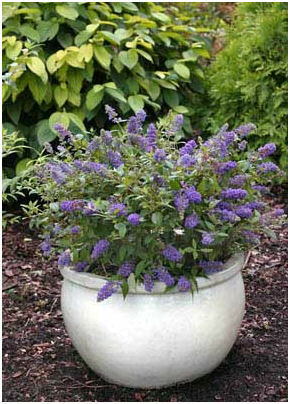 Perennials in container gardens can be enjoyed for a long time if you choose your plants wisely and take care of them. Container gardening with perennials gives gardeners a head start on the growing season. Waiting until May to plant your containers is not necessary. These plants can handle cold weather so you can plant them in April and add some annuals in May after the threat of frost. Container gardening with perennials allows you to try growing perennial pllants that normally wouldn’t grow in your climate, or the soil, at your home. Perennials in container gardens typically flower only once in the summer, some for longer period of time than others. It’s best therefore to mix them with annuals so you’ll have continuous blooms during spring-fall. Choose plants that are compact and recommended for containers. Make sure they have the recommended sunlight and water requirements and they should grow well. During winter months, protection is a necessity for plants grown in containers, especially in cold climates. Move them to an unheated building or garage, or wrap the pots with insulating material that will protect the roots. Most perennials indicated for your hardiness zone will survive the winter in containers. However, many experts suggest that when container gardening with perennials, you should choose plants that are hardiness rated 2 zones colder than your own for best results. Taking steps to overwinter your perennials will help insure they make it through the winter and are ready to bloom again in spring and summer. When designing your container garden, choose a tall, spiky plant for the center. Plant fillers around the tall plant and then plant trailing plants along the outside edge of the pot. Someone on HGTV said this design is based on “thrillers, fillers and spillers”. Thrillers are the plants that get the most attention – they are centered. This may be a plant with nice foliage or shape since they will not bloom as long as annuals. 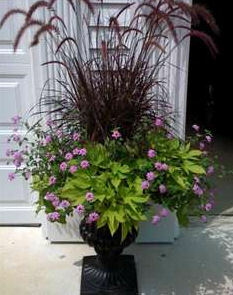 Ornamental grasses make nice “thrillers”and they will overwinter in containers. Fillers are the plants that make up most of the space remaining in the pot. They make the container look fuller. 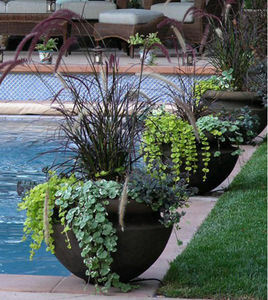 Finally, spillers are trailing or vining plants that grow over the edge of the container. They help blend the contents all together and give the pot a finished look. 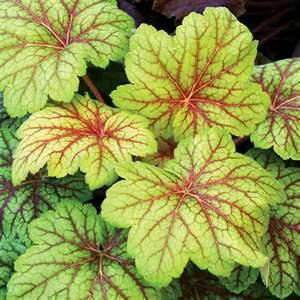 Heucheras make great fillers in containers, but are also lovely as a single planting. Not every container garden needs all three elements – you may want to plant only one kind of plant in a pot, or combine single planted pots with combinations – or group containers together – a single, mature perennial like a hosta, is lovely when surrounded by other containers of flowering or combination plantings. Compact or mounding plants grow better in containers than ones that spread. Choosing plants will spread will require transplanting soon because they will outgrow their containers quickly. Because their roots are restrained, perennials in containers may not grow to their mature size. A plant that would grow to a height of 3 feet in the ground, may only grow half that tall in a pot. If you want your container to look full the first year you plant it, start with a mature plant. Hostas, shown right, are one of my favorite perennials. So much show, that I have a page dedicated to them. 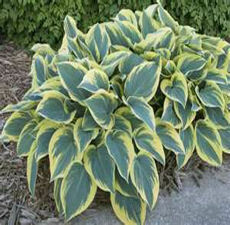 Hostas come in a huge variety of sizes, shapes and colors. They are versatile and make great plantings in a container alone, or in combination with other plants. Stick a few annual flowers among them in reds, yellow or purples and you have great contrast with their green and white foliage. Some perennials will not look their best in a container during their first season. Peonies, and astilbes, for example take more than a year to get well established in a container. Keep their containers in a background location the first year, but don’t give up and toss them – they will be nice the second year. Container gardening with perennials will require a bigger pot. For these plants, the bigger the container, the better. Perennials have larger root systems than annuals and need more space to grow well. In colder climates, plantings in bigger pots will get through the winter more successfully.The size of the pot makes a difference. In zones 1-7, pots should be 12 inches or more in diameter. A depth of 12 inches is also recommended. Most materials will work fine for planting, but if you live in an area that freezes, don’t use unglazed terra- cotta pots as they may crack during the winter. The container absolutely must have good drainage. Drill a drainage hole, or extra ones if needed. You may also want to place landscape fabric over the bottom of the container – this will allow water to drain but will keep soil from plugging up the drainage holes. Adding pea gravel or shards of pottery to the bottom of the container will also help it drain better. Space your plants closer in your container than you would if planting in the ground. You want your container to look nice right after you plant it and not have big gaps of soil showing. Place your plants with just enough space so that the container will fill in within a couple of weeks. Start with a clean container. If it has been previously used, disinfect with a mild solution of water and bleach. Make sure the finished planting depth of the plant is the same as it was in the nursery pot. Plant your tallest plants first, then the surrounding plants, and finally, the trailing plants around the edge of the pot if you are using those. Gently loosen the roots before planting and if the roots are bound, make some small vertical slits in the root ball. Fill the container with soil up to about an inch from the top. You don’t want the soil to wash over the top when you water. Press the soil firmly around roots and water thoroughly when done. Container gardening with perennials will require some ongoing maintenance. Keep your plants looking their best by dead-heading. This is simply pinching off the dead blooms which promotes more blooms. Remove any yellow or dead foliage as soon as it appears. Because plants in container gardens are crowded together, and because they require lots of water, nutrients will deplete after a few weeks. Use a water soluble liquid fertilizer every couple of weeks. Each spring, repot the perennials or at least give them some new soil. If you don’t want to completely repot, remove the first few inches of soil and replace it with new soil that has a fertilizer component added to it. If your plants have outgrown their pots, or need to be divided, spring is the time to do it. Look here for some recommendations for container gardening with perennials.